How Dangerous Are U.S. Treasury Notes and Bonds? A lot has been written and said about how much money U.S. Treasury note and bond investors will lose when interest rates rise in the years to come, as they are expected but not guaranteed to do. However, I have yet to see or hear anything about the risk involved in waiting to exit a Treasuries position or speculating on Treasuries to increase in value in the short-term. On Friday (5/3/13), the yields for the 5-year note, the 10-year note, and the 30-year bond increased by 8.3, 12.1, and 13.8 basis points respectively. This was a very small taste of the risk involved. To measure the risk involved, we need to estimate what Treasury yields would be in a more normal environment. 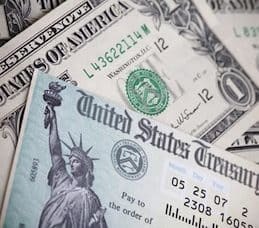 In this article, I will focus on the 10-year note, as this is the most widely followed longer-term U.S. fixed-income instrument. There is no perfect way to estimate what 10-year Treasury yields would be in a more normal environment, but there are ways. The below is one way. The above calculation indicates that 10-year Treasuries should currently be yielding 3.87%. This is about 2.13% higher than the 1.752% yield as of Friday’s close. A 10-year Treasury note is a commitment to lend money for 10 years. It does not only matter what an appropriate yield is for the next year. It also matters what an appropriate yield is for one to two, two to three, three to four… and nine to ten years from now. It is not only CBO (Congressional Budget Office) projections that indicate the current 10-year Treasury yield is absurdly low. All other earnest, quality projections I am aware of indicate the same thing. For example, the March 2013 projections of the 19 Federal Reserve Board Members and Federal Bank Presidents (Fed) indicate the same thing. The average of the 19 Fed projections for the target federal funds rate in the “longer run” is 4.01%. As you can see in the chart below, 3-month Treasury yields almost mirror the federal funds effective rate (which, of course, almost mirrors the target federal funds rate). Using every-business-day Fed data from 1/4/82 to 5/2/13, 3-month Treasury yields were, on average, 94.1% of the federal funds effective rate. This 94.1% statistic places the Fed-projections-implied longer-run 3-month Treasury yield at 3.78%, which is similar to the CBO longer-run 3-month Treasury yield projection of 4%. The difference between the 3.78% and 4% figures may be explained by the CBO adjusting for the U.S. having a higher debt level in the longer run than it had previously. A good question is: If 10-year Treasuries should currently be yielding about 3.87%, why are they currently yielding only 1.752% instead? There are multiple reasons for this. The Fed is buying a lot of 10-year Treasuries, and other Treasuries, via QE (quantitative easing); and the marketplace is not properly adjusting for this factor given (2), (3), (4), (5), (6), and (7) below. Some people are buying Treasury notes and bonds as a shorter-term trade because they do not think Treasury note and bond yields are going to increase yet, despite what Treasury notes and bonds should currently be yielding or absent this knowledge. Anyone who bought 10-year Treasuries in the 14 trading days prior to Friday and maintained their position is negative on their trade as of Friday’s close. This is also true for the vast majority of people who bought within 5/17/12 to 12/31/12, and some brief other time periods, if they maintained their positions. What is written and said is often not a reflection of what is true. It is a reflection of financial motivation. Among developed nations, at least, America is worse in this respect. Do not mistake someone’s sales-pitch-in-disguise for a genuine attempt to help. A lot of people make money via fixed-income investors. Many of these people are not offering CD, longer-term corporate bond, or longer-term municipal bond investments you can hold to maturity (i.e., TMTC [to-maturity-then-cash] investments). These people are motivated to promote what they do have to offer. Even if someone does offer CD, longer-term corporate bond, or longer-term municipal bond investments you can hold to maturity, they may not be the most profitable things they can promote. This is the purpose of the 0-0.25% target federal funds rate and QE. This desire for low rates directly and indirectly influences various communications in a manner which makes the current 1.752% 10-year Treasuries yield, and other Treasury note and bond yields, seem far less low than they actually are. If you are assisting the country by buying these Treasuries, thank you. If you cannot afford such generosity, be aware that current yields are absurdly low. Sometimes, non-professional traders and investors need to lose money before they will stop buying and/or sell. They may not properly research the situation until a large loss occurs. Even after a large loss occurs, they may not have sufficient spare time to do proper research; but they will still be more influenced to not buy and/or sell due to the financial pain they experienced. The theory that a significant amount of money will move out of fixed-income funds―most of which, by far, do not hold their investments to maturity and then pay cash―once interest rates rise is related to this. This theory is sound, and it is probably correct regarding what will happen. In early April 2013, Japan greatly expanded its QE program with the target of achieving 2% inflation “at the earliest possible time, with a time horizon of about two years”. Japan was experiencing deflation when this move was made. Japanese QE should only have a minor effect on U.S. Treasury note and bond yields because less than 10% of outstanding JGBs (Japanese government bonds) are foreign-held and money from home tends to stay home. Nonetheless, the strong expansion of Japanese QE has served as a selling point for those promoting the purchase and/or holding of U.S. Treasury notes and bonds. The 10-year JGB yield has been at or below about 2% since October 1997 (i.e., for 15 years, 7 months). During this time period, the yield has been as low as about 0.5%. As of Friday’s close, the yield was 0.57%. Japan in the last decade or two was very much unlike the U.S. though. Japan experienced inflation of about 0%. This is 2% less than the U.S. inflation target. From October 1997 to today, Japan’s population barely grew. Saying the U.S. will become like what Japan was is like saying this apple is now going to taste like that orange. Nonetheless, Japan’s interest rate experiences in the last decade or two have served as a selling point for those promoting the purchase and/or holding of U.S. Treasury notes and bonds. It is possible that U.S. Treasury note and bond yields will not increase significantly for a while. Per a recent Bloomberg economist survey, the median projection of economists is that U.S. QE will not end until the first half of 2014, although a lessening of the amount of QE per month was projected as likely to occur later this year. Per the 2/5/13 CBO The Budget and Economic Outlook: Fiscal Years 2013 to 2023 report, U.S. GDP (gross domestic product) growth is not projected to increase substantially until 2014. The IMF (International Monetary Fund), in its April 2013 World Economic Outlook report, projected U.S. GDP likewise. These conditions help maintain an environment in which buying and holding Treasury notes or bonds is perceived as safe for the time being―which it may turn out to be, although it is not genuinely safe. There will come a time when it does not matter whether Bill Gross, Jeffrey Gundlach, or whomever says that Treasury notes and bonds are a good buy. These people have a limited ability to sway market sentiment, thereby making something that may not have been true before they spoke true after they speak. Sometime in the not-too-distant future, it will become clear that U.S. QE is likely to be lessened soon, U.S. QE is likely to end soon, U.S. GDP growth is likely to increase substantially soon, et cetera. As these things occur, the pressure on Treasury note and bond yields to rise will mount; and mere words will be unable to make these yields about as low or lower than they were at Friday’s close. I came here from a Jeff Miller link. It is likely rates will rise at some point. But using some CBO projections as a basis for an argument about how “absurdly low” long rates are in the US is in its own way absurd. Any forward looking forecasts by CBO are not worth the paper on which they are printed. They are not even worth the electricity to store them as digits. CBO projections are just totally useless. This makes your argument somewhat ridiculous. Rates will rise when there is a genuine upsurge in economic activity such that the price of money rises. For a variety of reasons that time is likely not soon. Not soon at all. Your statements regarding the value of CBO projections are, at best, extreme exaggerations. I cannot respect someone when they say things like this; yet, I would never say: “Tom Bergerson’s thoughts are totally useless.” Of course they are not. The CBO’s projections are relatively consistent with the projections of other reputable sources (Reread the article for examples. ), but they cover a greater number of years. Rates have risen and will rise in anticipation of events, not upon them. “In anticipation” may mean about three to six months in advance. I should add, rates can also rise when sentiment arises above some threshold that there is risk of repayment in treasuries I suppose, or when there is a dollar crisis. These might be alternate routes to rising yields.